The Chevrolet Suburban traces its roots to 1935, and 78 years later, this full-size SUV proudly claims its status as the oldest continuous nameplate in automotive history. While drivers' preferences have changed and gas prices have steadily climbed over the years, there are still families and fleets that yearn for or even require a massive, fuel-thirsty sport utility vehicle that can easily haul people and cargo. In those respects, the Chevy Suburban for 2013 and its twin, the GMC Yukon XL, are among the rare SUVs that can be configured to carry up to nine passengers and tow well over 9,000 pounds. Available in half-ton (1500) and heavy-duty (2500) three-quarter-ton models, the Suburban comes in trims that range from the basic to amenity-laden. The Suburban has long earned its stripes as an SUV that can carry lots of people and haul lots of stuff. The 2013 Chevy Suburban continues that mission while offering a rugged image and many creature comforts. There's no hiding it: The Suburban is big and thirsty. At over 18 feet long it's no joy to park, and fuel economy is dismal, from a high of 21 mpg to a low of 10 mpg. If you don't need to tow massive loads, consider a Chevy Traverse, which has a better ride and higher fuel economy. The 2013 Suburban carries over with minimal changes. Aside from new exterior color choices, the biggest new feature is that powertrain grade braking, previously used only in tow/haul mode, now works in normal transmission mode. The feature slows the vehicle on steep descents using engine torque, which can reduce brake wear. Although the Chevy Suburban is built on a truck frame that's intended to pull or carry heavy loads, the big SUV offers a relatively comfortable ride around town and on the highway. Bumps and road imperfections are not exactly blunted, but the Chevy's suspension does an admirable job absorbing them. Both V8 engines offered do a capable job of getting this SUV up to speed, and the Suburban's 6-speed automatic transmission is smooth. More powertrain noise makes its way into the cabin than some drivers may prefer. Due to its sheer length, the 2013 Suburban requires care when maneuvering, especially in tight spots such as parking lots. If you plan to park this vehicle in your garage, make sure its footprint will be accommodated in the space available. Both V8 engines offered in the 2013 Suburban can deactivate four cylinders during light-load driving conditions such as cruising on a flat highway. Doing this conserves some fuel and cuts emissions. When full power is needed, the cylinders are reactivated almost instantaneously. No matter your leg length, it's easier to find a good fit behind the wheel thanks to the power-adjustable floor pedals. The feature is standard on LT and LTZ trims and available as an option in the base LS trim. The Suburban is one of the relatively few new vehicles that can still be had with a 3-passenger bench seat up front. Combined with two other rows of 3-person benches, the Suburban can comfortably carry up to nine people. Alternatively, it can be had with pairs of front- and second-row bucket seats, allowing for greater comfort of two people in each row. Fold-and-tumble second-row seats make for easier access to the third-row seats, which can split and fold in a 50/50 fashion. Cargo room is enormous, and even with the third-row seats up, there is over 45 cubic feet of space. Up front, the 2013 Suburban is conservative yet attractive, though base LS versions still have far too many plastic bits. The 2013 Suburban looks much the same as it has for decades: like a giant metal rectangle on wheels. A visual definition of utility, the big Chevy's boxy shape stands in contrast to the curves, waves and wild angles adorning other people-movers. Dress one of these – and yourself – in black, and some might suspect you're part of a secretive government agency. Up front is a big, 2-bar honeycomb grille with the Chevy bow-tie icon sandwiched between. The broad sides are highlighted by three boxes of windows and prominent wheel arches. Rear-wheel-drive versions have 8.9 inches of ground clearance, and 4-wheel-drive versions sit a bit higher, with 9.2 inches of clearance. 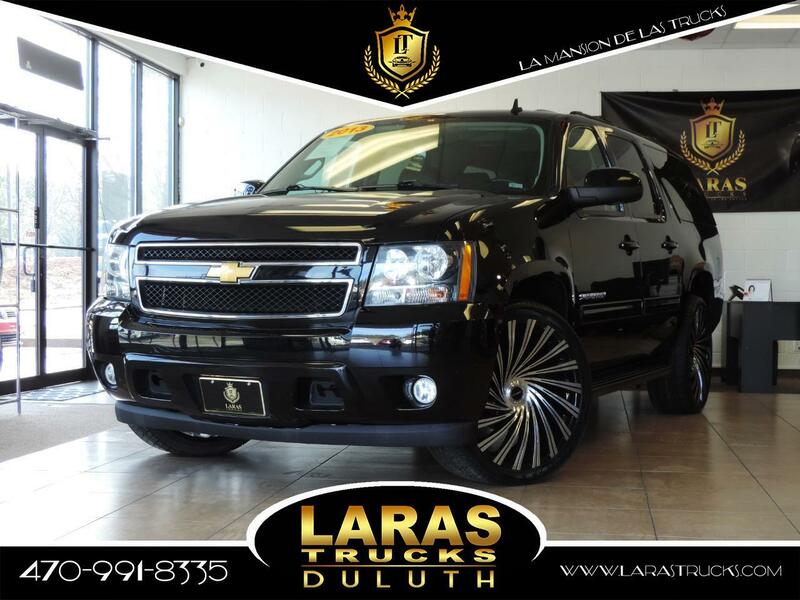 The 2013 Chevy Suburban 1500 comes in three trims: LS, LT and top-of-the-line LTZ. (The 2500 three-quarter-ton models come in LS and LT trims.) Rear-wheel drive is standard, with 4-wheel drive an option. Base LS versions are equipped with tri-zone air conditioning, cruise control, Bluetooth, AM/FM/CD player with USB port, 17-inch wheels, and six months of complimentary service to OnStar Directions & Connections plan. Stepping up to the LTZ trim brings much more, including leather seats, heated and cooled front seats, Autoride suspension, locking rear differential, blind-spot monitoring system, rearview camera, rear parking assist, 20-inch wheels, and upgraded Bose audio system with 7-inch touch screen and 30-gig hard drive. Add-ons and extras for the 2013 Suburban include power sunroof, rear DVD entertainment system with two sets of wireless headphones, Z71 off-road appearance package, 2-speed transfer case, rearview camera and parking assist for lower trims, engine block heater, heavy-duty trailering package, 22-inch wheels, retractable side steps, and third-row DVD screen. The 2013 Chevrolet Suburban 1500 half-ton SUV has a 5.3-liter V8 that delivers 320 horsepower. The heavy-duty Suburban 2500 three-quarter-ton SUV packs a bigger punch with its 352-horsepower 6.0-liter V8. Both engines run on regular unleaded or E85 ethanol blend and feature Chevy's Active Fuel Management system, which cuts power from eight to four cylinders under light-load situations. Both engines are connected to a 6-speed Hydra-Matic automatic transmission. The 2013 Chevy Suburban 1500 has a Manufacturer's Suggested Retail Price (MSRP) starting just over $43,500 for a base LS model. A top-line, 4-wheel-drive LTZ model with options can reach over $65,000. Three-quarter-ton 2500 models add roughly $1,200 to the price. At these prices, the 2013 Suburban is in line with big SUVs such as the Ford Expedition, Nissan Armada, and Toyota Sequoia. Be sure to check the Kelley Blue Book Fair Purchase Price to see what other buyers in your area are paying for the 2013 Suburban. Down the road, the Suburban's resale value is expected to be marginal, similar to the Ford Expedition and Nissan Armada, and trailing the Toyota Sequoia. Message: Thought you might be interested in this 2013 Chevrolet Suburban.